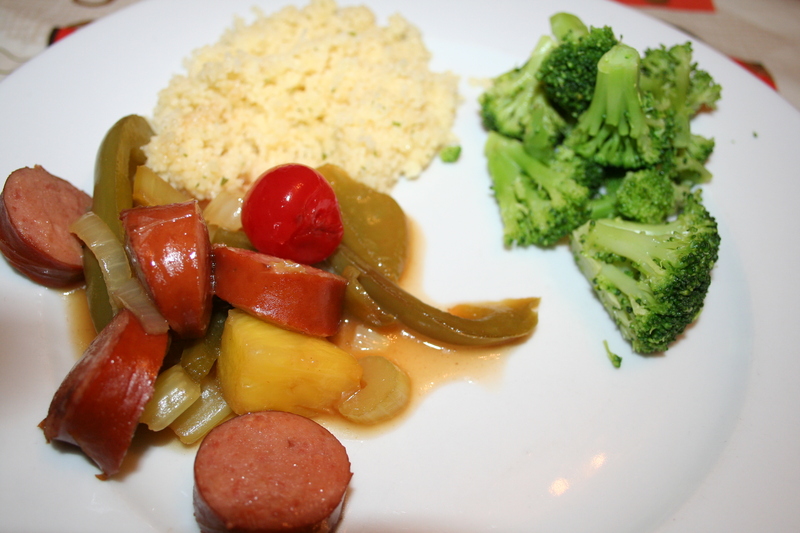 We’ve been on quite the kielbasa kick lately! Our family has always loved kielbasa. I can remember being in high school and buying “hot lunch” on the days that kielbasa was on the lunch menu. Lately we’ve been buying it to use every once in a while for our meals, just to break things up, as long as it’s a lowfat turkey kielbasa, not the regular kind. All of our kids like it and it’s affordable. We find ours at Aldi’s. Recently Don found a recipe for a lowfat sweet and sour sauce for chicken, on food.com, and he used it to make the kielbasa. It was delicious. We served it with a lowfat couscous and a side of broccoli. Everyone loved it, we’d make it again, and I’d make it for chicken too! Today I share that recipe with you for my What’s for Dinner Wednesday post. It might make a healthier option for a Superbowl Sunday game dish in a couple of weeks, if you’d like to give it a try. I love how pretty this dish looks. Don threw in the cherries as a treat for the kids, but I loved what it did for the colors in the dish too! In a large skillet, bring chicken and stock to a simmer over med-high heat. Add celery, onion and sweet peppers; cook, stirring often, for about 5 minutes, or until chicken is no longer pink inside, and veggies are almost tender-crisp. Mix together the juice, brown sugar, vinegar and soy sauce until blended. Stir into skillet; bring to a boil. Cook, stirring for about 2 minutes, or until glossy and thickened. Mix the cornstarch with a small amount of cold water and add to the simmering sauce to thicken. 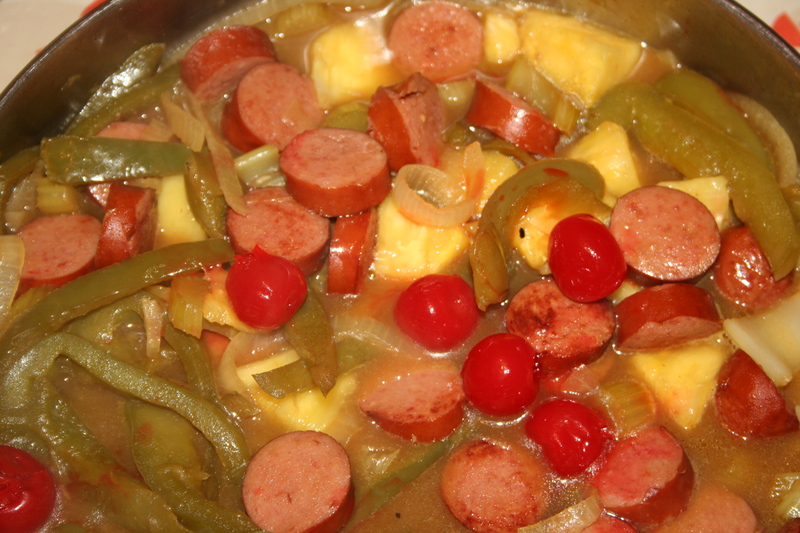 Add mango or pineapple chunks (if using), salt and pepper; simmer for 2 minutes, or until heated through. Yum! This looks great.. Will be definitely be trying this… Thanks for sharing! I’m glad! Thanks for always reading! It’s 2am and after reading this post, I am so hungry, this looks delicious; I used to work downtown and I had to limit myself of how much I would eat this, it was too good and accessible every day (it was not healthy like yours) now I miss it but thanks for sharing this recipe!